Proposed residential, commercial and office space, all within the FEMA-designated floodplain. Required access to the waterfront is via corridors through which flood waters will easily travel to adjacent streets and beyond. Land elevation is among the lowest in this part of the east bank of the East River. 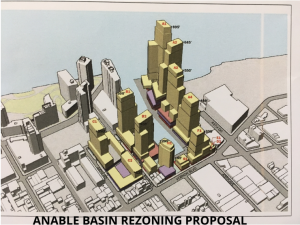 The density of buildings cries for significant areas set aside as open space, not the narrow fragment proposed to accommodate at least 10,000 residents and hundreds of workers, and thousands of dogs. Public Meeting, Thursday 14 December 2017, 5pm CUNY Law School. View Plaxall’s own website for this project and/or their factsheet. View Hi Res renderings in this dropbox folder. 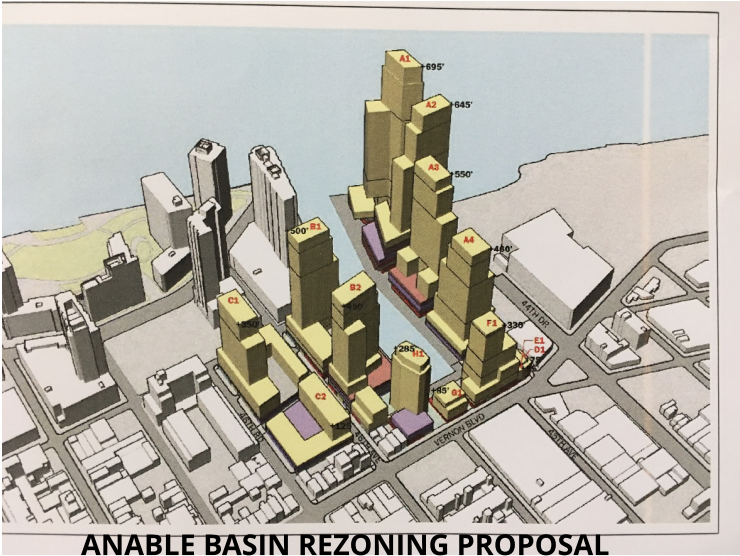 NOV 14, 2017: Proposed Long Island City rezoning would bring 5,000 apartments to Anable Basin, CURBED, by Zoe Rosenberg.